Well, here we are again. Spring is right around the corner. We have good ice, but all I can think about is getting out in the woods after those dam stinky birds! I apologize if I offend anyone when I refer to turkeys as “stinky birds,” but let’s face it people, those rascals are gamey and smelly. Ever gut one without gloves? I did and my hands stunk for a week! The smell was so burned into my sinuses that even “me Lucky Charms” tasted like that stinky turkey! Since that day I have discovered other ways to clean the birds and trust me when I say that I’ve never stuck my hands into the cavity of one of those creatures again! My true reality is that although I have learned to prepare the meat properly, food is not the motivation! It’s the hunt! 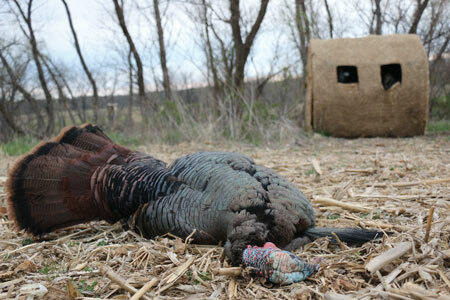 I love to call and chase these stinky birds as much as I enjoy any other hunt. One of my favorites is hearing the toms break the morning silence with their thunderous serenade of gobbles. Also, knowing that their eyesight is unmatched in nature adds to the pursuit. They are afraid of everything including, it seems at times, their own shadow. These birds, be it a jake or a tom, pose a great hunting challenge. I hunt land in Southwestern Wisconsin. We have a solid turkey population for sure. Being a landowner, I have the additional advantage of being able to draw a tag for my primary season choice. Being that my kids are in that really active sports phase, my season preference has changed over the years. I am glad to say that I have bounced around on seasons so that I can experience them all. I have discovered that I absolutely love each season! The early birds are less spooked, but the weather is such a wildcard that you never know what you are going to get. A very close friend, Mike, is an absolute turkey-hunting freak and swears by the early seasons. He loves being the first human these birds have seen in months…and if all goes according to his plan, he’s the last one as well. Mike will trudge through the open muddy fields on foot if need be. He’ll suffer through the notorious spring snows. Freezing temperatures mean nothing to him it will not keep him from pursuing one of these stinky birds! For me, I love the hunt but it’s not beyond me to whine and moan every step of the way when the conditions are bad. The late seasons hold my interest for many similar reasons as stated above. I enjoy the increasingly heavy understory of the springtime woods. Of course the sauna like moist heat created when the forest floor is warmed by the intense sunlight brings another challenge. Regardless of season, the birds maintain their sight advantage. They easily pick out the impatient hunter, guilty of an imprudent movement while they remain hidden in the thick brush invisible to human intruders. The lone gobbler is quiet and cautious sure, but he’s still not a dummy. Although I have bounced around seasons for a long time, I am always in the woods this time of year…it’s MOREL MUSHROOM SEASON! Now there’s some good eating! But that’s a tale for another time. Happy hunting this spring my friends! Be safe, shoot straight and introduce someone new to the sport. It’s an easy hunt to fall in love with!